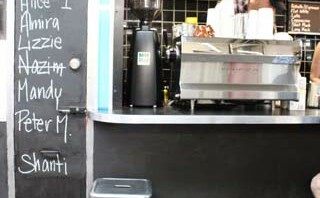 This cafe-bar – a tiny hole in the wall down in the subway linking Flinders Street station to Degraves Street – is a godsend for the caffeine-needy underground commuter. The morning queue is handy, as awakening brains may take a while to decide between the Ethiopian Yirgacheffe and the daily house blend. Nonetheless, the efficient owner-barista duo Courtney and Verity (ex Vue de Monde) elicit a decision and set the Synesso to work on my African beans. The fruity aroma of my espresso is an immediate boost, but it’s the wild acidity and dazzling lemon and lime notes that cures the Mondayitis. The latte is equally uplifting; the soft texture and sweet creaminess of the milk complement the wildness of the Brazilian house blend, and a heavenly dark chocolate bitterness lingers on the palate. Without a doubt, it’s worth descending into Melbourne’s infernal commuter depths for this superlative devil’s cup.